After a morning of exploring the beautiful views that Budapest has to offer, and before a long night of indulging in its famous nightlife filled with awesome pubs of ruin… you must make sure to stop by the thermal baths that will leave you feeling relaxed and ready for the rest of your hungarian adventure. The prettiest hot springs are found inside the Danubius Gellert Hotel near the Liberty Bridge on the Buda side of the city and are remnants of the ancient baths that were created for bathing and medicinal purposes during the Turkish period from 1541-1686. With the water that comes from 123 different thermal springs you can feel the remedies that these baths have to offer. The bathing complex that I had the pleasure of visiting was called Szechenyi, which is one of the largest ones in Europe. Admission is around 4600 HUF (about 15 Euro) and includes a locker. I went around 3:30pm which was just enough time to catch the scene in the daylight but was able to stay and watch the day turn to night as I soaked in the hot baths for a few hours. There are all different kinds of baths both inside and outside with varying temperatures throughout the grounds along with saunas and other things. Some that I saw were: a whirl pool, a lap pool, a plunge pool, a couple basic large hot tubs and plenty of others for different reasons and uses. There are also a couple little bars scattered where you can enjoy a cold beer or a hot mulled wine! Since you can’t be in the water with a drink, I took mine and sat on one of the benches surrounding the baths and couldn’t help but think how crazy it was that I was sitting in my bathing suit in the middle of November with a drink in hand watching all the activity going on around me while in the presence of these historical baths. Along the outsides you see older men playing chess in their speedos or older women with their water weights lifting away. 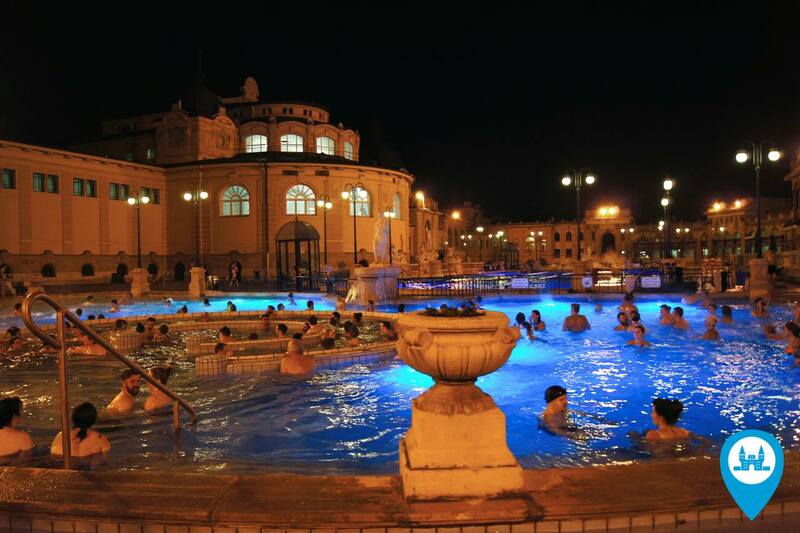 I think it is so awesome that this thermal experience is a daily part of the hungarian culture and that these people, tourists aside, come to the baths almost everyday to get their thermal fix. When you’ve had enough and your whole body is close to pruned— you can go inside to rinse off and get your things from the lockers and walk back out into the city with a clear mind and the most refreshed feeling! I hope to go back here again one day.